Aviva Stadium is the name of Ireland’s national sports stadium which is used to host both Rugby and Football matches. 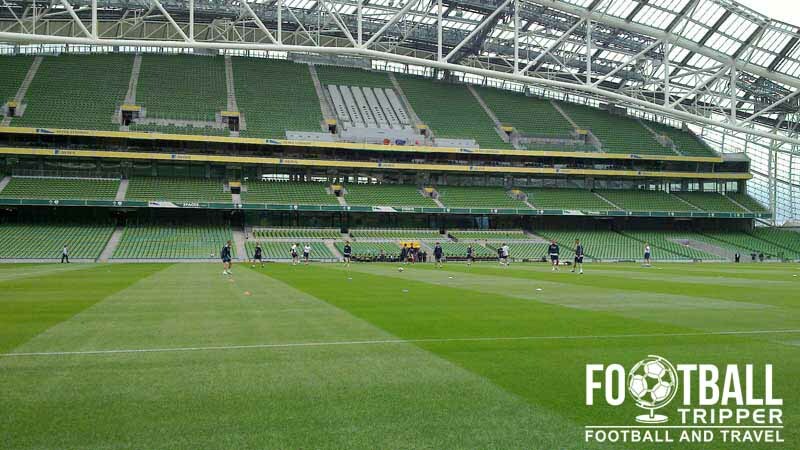 First opened in 2010 with a capacity of 51,700, the Aviva replaced the former Lansdowne Road stadium. Aviva Stadium first opened on 14th May 2010 with the inaugural football match held a few months later in June between Manchester United and a League of Ireland X1. Attracting 49,800 fans, the opening football match was almost a sell-out, with the Aviva fully occupied during a 2014 World cup qualification match against eventual tournament winners Germany on 12th October 2012. Built to replace the former Lansdowne Road Stadium, Aviva Stadium is located on the same site of the former national stadium with construction taking just over three years between 2007 – 2010. 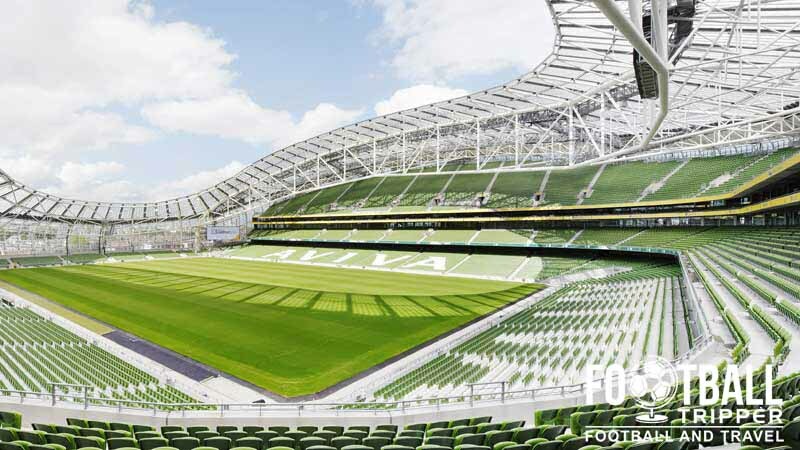 The creation of a new stadium represented a joint venture between the Football Association of Ireland the Irish Rugby Football Union with each governing body owning half of the stadium. Whilst some fans speculated that the ground might be known as either New Lansdowne Road or Eircom Park, the naming rights were purchased by Aviva Group Ireland who are the largest general health insurers in Ireland. The ground has been warmly received since opening having won a British Construction Industry Award upon opening in 2011. Costing an estimated €410 million with just under half of this coming from public funding, the stadium is a large four-tiered bowl-shaped construction and is capable of seating 51,700 during sports matches. Designed by famous sporting architects Populous who also built England’s Wembley Stadium and South Africa’s National Stadium, The Calabash. Regarded as a UEFA Elite Stadium capable of holding some of the most important footballing fixtures in the continent, The Aviva successfully hosted the 2011 Europa League final which was contested Portuguese sides, Porto and Braga. No doubt the Aviva will continue to host some of the biggest football matches in the future. 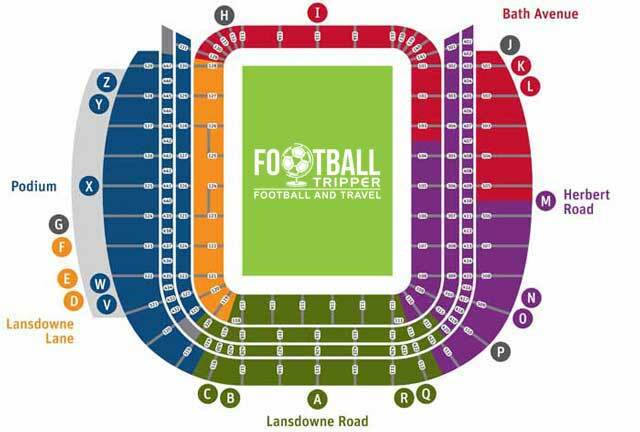 For International fixtures away fans have so far been housed within the North Stand which is accessible from the entrance coloured red on Bath Avenue. This is of course the smallest section of the ground, and really creates a “them v us mentality” once inside the ground. As beautiful as the roof is, it doesn’t cover the entirety of the north stand and the seats towards the front are vulnerable to rain. For most fans the matchday experience begins within the centre of the city, and the Irish certainly have some great pubs such as The Temple Bar, The Bull and Castle and The Long Hall Victorian pub. With such a high-density of pubs within the city most fans choose to exclusively drink there before heading to the stadium and to avoid the congestion, with this plan also validated by the lack of pubs within the immediate area of the stadium. The two closest pubs to Aviva Stadium are the Chop House and The Bath Pub are decent enough, however they are often rammed full on matchdays. Some fans recommend making a compromise between the two locations and walking to Grand Canal where there is the spacious Searsons of Baggot Street. Similar to the pub situation there are a real lack of external food options as you get closer to Lansdowne Road and the surrounding residential areas. The advice would be to grab something to eat in the city where there is plenty of choice or to tuck into a pie or burger inside the concourse before, during or after the match. There doesn’t appear to be a permanent club-shop located within the ground, however on the day of matches there is always a good mixture of both official and unofficial merchandise on sale. Failing this you could always visit the online FAI Shop which has the most extensive range of football gear in Ireland. 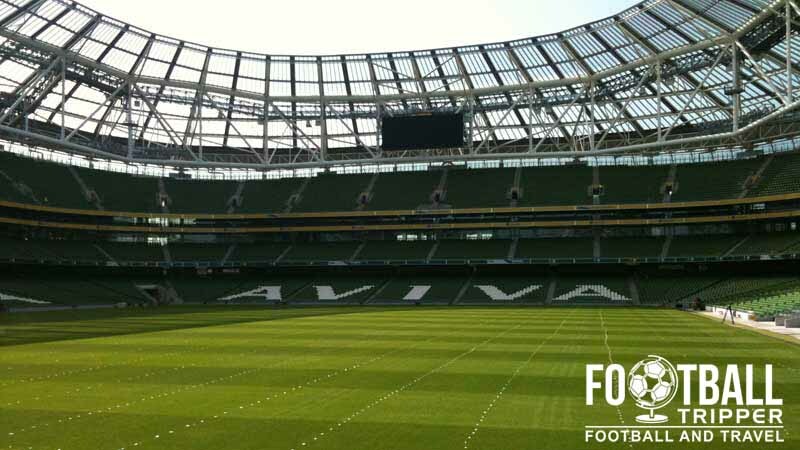 Fans of both Football and Rugby can now learn more about Aviva Stadium by undertaking a fully-guided 70 minute tour of the facilities at Lansdowne Road. Running for 7 times a day, 7 days a week between 10.00 am – 4.00 pm, the stadium tour is slowly becoming one of the most popular tourist attractions in Dublin. Inside the home dressing room with Irish rugby kits on display. To purchase football tickets for Aviva Park you can either send an email to customer services on [email protected], phone the box-office on 01 8999500 please visit the official FAI Ticket Page. 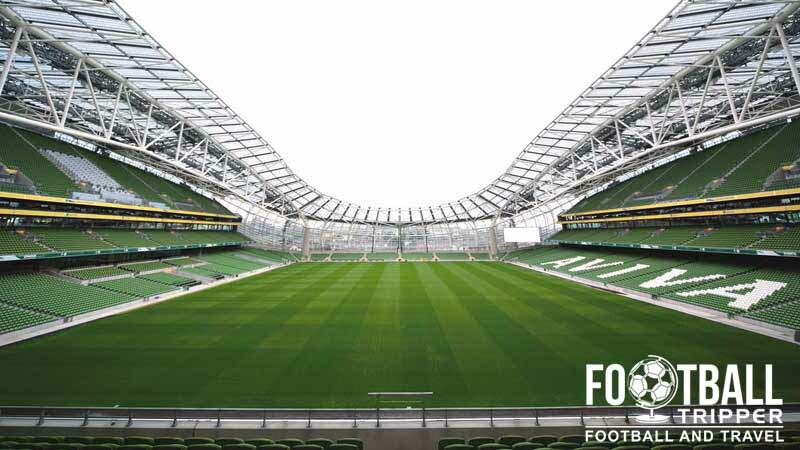 Aviva Stadium is located approximately 2 miles (3km) south-east of Dublin City Centre on the northern bank of the River Dodder close to Ballsbridge and Sandymount. Driving right up to the stadium is strongly discouraged as roads leading up to the stadiums are closed for up to 4 hours before kick-off as to make it safe for pedestrians. The club recommends taking advantage of one of the many forms of public transport listed within this official matchday travel guide. There are no public match day parking facilities at the stadium, save for a small amount of disabled parking spaces which are available upon request for people with reduced mobility. Known as the DART, you can catch the train service southwards to the Aviva from multiple locations throughout the city centre including: Pearse Station on Westland Row, Tara Street Station and Connolly Station which also has a link with the city’s tram system known as LUAS. A great picture of the station’s main platform with the Aviva in the background. The line actually runs beneath the West Stand of the stadium, and stops at Lansdowne Road itself which is easy to remember as it is the name of the former national stadium before the Aviva was built. From the city centre you need to head southbound towards either Greystones or Bray. For more information about DART (Dublin Area Rapid Transport) or to find the latests timetables please visit this page of the Irish Rail website. Alternatively you can try phoning the help line on 353 (0)1 7033504 . From O’Connell Street and O’Connell Bridge in Dublin city centre you can catch the 4, 7 and 8 bus services to Ballsbridge which go past the stadium on both match and non-matchdays. International visitors will be pleased to know that Aviva Stadium is less than 6.3 miles from Dublin International Airport. Upon arrival you can catch a 24 hour shuttle bus service for a couple of euros which will take you to the D4 inn which is on Lansdowne Road, where the ground is located. There are a limited range of hotels less than five minutes south-west of Lansdowne Lane such as the massively expensive Ariel House, and the more modest Ballsbridge and Butlers Townhouse hotels. 20 minutes away with the centre of Dublin there are of course plenty of other choices.